A SCHOOLBOY once asked George Daniels what he had at the end of the chain that led to his pocket. A silly question, really. But it was worth asking, because what Mr Daniels pulled out, carefully, was what he called his Space Traveller's Watch. It gave mean solar time, mean sidereal time, equation of time, and could chart the phases of the moon. Mr Daniels liked to say it would be useful for trips to Mars. He had surmised almost the same when, at five or six, he had first prised open with a fairly blunt breadknife the back of an old watch he had found at home, and seen “the centre of the universe” inside. He had never imagined then that he would make the universe by hand. But he did. 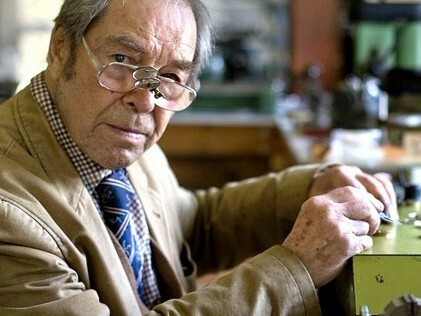 Every component of his Space Traveller's Watch—as of the 36 other watches he made, each unique, over his 42 working years—was produced from scratch. He made the screws, the springs and the levers, the pallets and gears, the hands and the plain, often numberless dials. He also made the tools that made them, except for the lathes and turning engines. No one else had ever learned the dozens of necessary skills. But after years of teaching himself horology from clocks bought for a bob or two at jumble sales, or comrades' broken watches in the army, or the wonderful Breguet and old English timepieces he went on to restore for collectors, he had begun to think, why not? Hour after hour, for it wasn't the sort of work you could just do a little of and leave again, he would cut and shape, file and polish, temper and hammer. The work flowed from the tools almost unconsciously. He learned from a craftsman in Clerkenwell how to make cases, usually of gold with a silver back and bezels. His first watch was sold to a collector friend, Sam Clutton, in 1970 for ￡1,900; when sold in 2002, it fetched more than ￡200,000. A hard, poor childhood in north London had given him a nose for a deal and a sharp sense of the value of everything. But his pieces were private experiments, not commissions. He wanted to build watches that kept better time than any in the 500 years before. The general public was happy, from the late 1960s, with quartz models that lost, on average, two or three seconds a month. But Mr Daniels was determined to show that a mechanical watch could beat them. In the mid-1970s he made a double-escapement watch for Mr Clutton which, over 32 days, lost less than a second. His happiness at beating quartz came close to his boyhood joy when a wall-clock he had mended magnificently exploded, springs and glass everywhere, as the family ate their bread and jam at the supper table. Now he had to improve on the lever escapement, which had been invented in 1754 by the English horologist Thomas Mudge and used in most watches since. It worked by friction, as the teeth of the gears slid over the pallet; but this arrangement needed lubrication, and as the oil degraded the watch lost time. Mr Daniels became obsessed with the tick, tock of clocks (a sound that filled his various homes, together with silvery chimes), and how to get an impulse on both the tick and the tock that would not be affected by humidity, temperature, oil sludge or agitation. His solution, invented in 1976, was the co-axial escapement, an arrangement in which two wheels, placed one above the other, transmitted to the pallet a radial impulse that needed no lubrication and so (if wound) would never stop. That achievement earned him many honours for services to horology, but it was only the beginning of a long slog to get his idea accepted. The world of clocks and watches was a closed one. He knew it himself, because his boyhood watch studies from library books were a private realm only he could understand, and the 18th-century English masters—Mudge, Arnold, Earnshaw—the only real friends he had. Watchmakers kept the secrets they learned in their lonely working hours. Even later, when he had put himself in the millionaires' bracket and had to move to the Isle of Man for tax reasons, his friends were in the motoring clubs where he shared his other passion, for vintage Bentleys and racing cars. He had no watchmaker friends at all. So it was no surprise to him, though keenly disappointing, that the Swiss watchmaking industry was neither eager to look at the co-axial escapement, nor able to understand it. He did the rounds of the factories for more than 20 years. After four years with Patek Philippe, he could not persuade them to make it. Omega began to produce it in limited editions in 2006, after seven years of “development” that Mr Daniels dismissed as unnecessary. Large-scale production would have been too expensive. But Mr Daniels also suspected sheer dislike of outsiders. While restoring the timepieces made by his idol Breguet in the 19th century, he had made two clocks in the same style, just to prove he could beat the master. They were so fine that the company insisted on putting the Breguet secret signatures on them. Mr Daniels went along with it. He had a secret cipher of his own, though, a dove with an olive branch. It meant peace to his rivals, French or Swiss; but if the most ingenious invention in watchmaking for 250 years was too tricky for them, why, he would just pick it up, snap it shut and put it back in his pocket.